शिक्षा बचाओ -- Shiksha Bachao: Rootless Rajputs! Ramayana and Mahabharata are just "Old Stories"
On page 22 of the history book for class 7 srudents, NCERT tells the child that nothing is certain about the roots of Rajputs. He is also told that they were either some tribe from central asia, or some local chiefs who claimed high status. 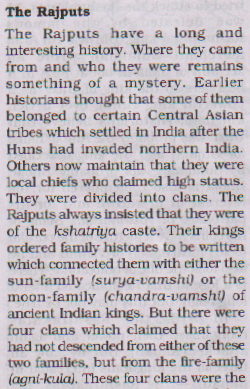 NCERT then tells the child that the Rajputs always insisted that they were of kshatriya caste! And that the Rajput Kings ordered historians to connect them either surya-vansh or chandra-vansh. A little knowledge is a dangerous thing. Nothing could hold more true for our historians than this old saying. They think that the "Surya" and "Chandra" are heavenly bodies and thus could not be anybody's ancestors. On the other hand, the Mugals have the well known ancestory of the invador Babar about whose barbarity Guru Nanakji has written in his poems. The other inheritors of his cruelity went on to commit henious crimes against the Gurus and their families in Punjab (if we care to remember the names of Hakikat Rai and Guru Ramdas and the four sons of Guru Gobind Sigh ji) and against the Rajput kings and their families in Rajsthan (Rana Pratap and Maratha patriots were able to prevail for quite sometime). But what is to be done when the countries so called leaders pronounce Ranaji to be a traitor and Akbar as one of the greatest rulers of India? We have a long way to go in terms of reclaiming our national pride in the right places. It will take some time, but it will be done.